In the midst of the gloomy autumn it's a perfect time to highligt your day with a small luxury fika at a cosy café called Biscuit! 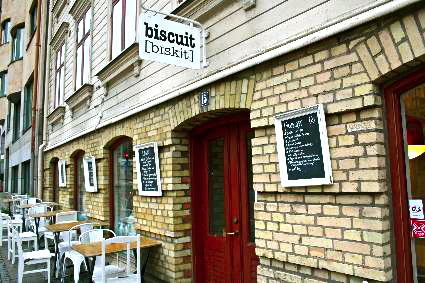 Biscuit is a small trendy café located right by Handels, in the corner street to Haga. It's a genuine and cosy café with a interesting mix of cakes and sallads together with a very friendly personnel that makes this place so popular. During the afternoons a mixed pool of both students, proffensionals, retiree flock to the petite café for a well deserved break of the day. This small trendy café serves a wide variety of homebaked cakes with homemade marmalade. It's one of the few places in Gothenburg that offers " Afternoon Tea Set" for 50kr includes a tea of your choice with two scones with cream cheese fruit and free marmalde buffé. The bright interior with a slight antique looking but trendy furnitures along with the homemade cakes really takes one away from the present into a very relaxed state. They also have a rich breakfast at Biscuit for 65kr (which is quite expensive), you can choose between a salty or sweat breakfast, the salty are usually pancakes and the sweet ones are scones with cream cheese, a small cake and a coffee or tea of your choice. It’s very nice to come to share a nice breakfast with your peers before starting the full-schedule day. 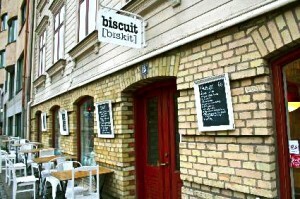 I can really recommend Biscuit, it's such a geniune and cosy café that serves great Swedish homemade delicacies.